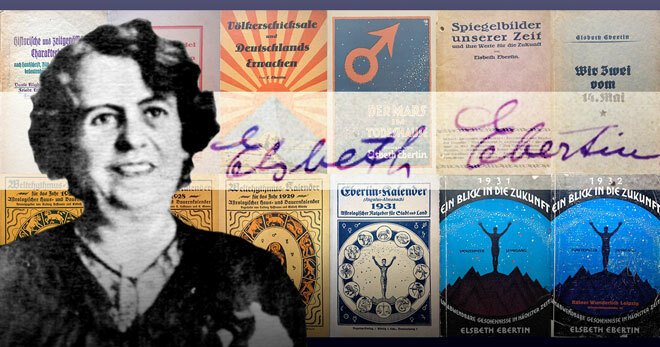 In episode 137 of the podcast Dr. Jenn Zahrt joins the show to talk about Elsbeth Ebertin, who was a famous German astrologer who lived in the early 20th century, and was one of the first prominent female astrologers in modern times. During the course of the show we talk about Elsbeth’s life and work, and in particular the flourishing of astrology that occurred in Germany during the period between World War I and World War II. You can find out more information Jenn’s work on her website JennZahrt.com. It is not until the 20th century that we see women emerge as leading figures in the astrological community. References to the earliest known female astrologers were discussed in ep. 86. One of the first notable figures was Elsbeth Ebertin. Elsbeth Ebertin (May 14, 1880 – November 28, 1944). She lived during World War I & II, and was most active in-between. Weimar Republic, the government of Germany from 1919 to 1933. She is often only known in the English-speaking world as the mother of Reinhold Ebertin, if at all. She was a notable astrologer in her own right though. Published 21 books about astrology between 1915 and 1932.
Who was Reinhold, and why is he better known in the English-speaking world? Reinhold founded the school known as Cosmobiology. Some of Reinhold’s books were translated into English, whereas hers were not. These translations had a major influence on later 20th century astrologers. Elsbeth was also largely forgotten in the German astro community. Much of the material she wrote was almanacs that were time sensitive. This material is interesting now because it says a lot about her times. She was very independent, and left her husband in 1905 to pursue publishing. She got really into graphology c. 1900. Published 6 books on subject between 1909–1914. Outlawed during WWI (1914–1918) as fortune telling. This partially precipitated a change to astrology for Elsbeth. Female graphologist introduced Elsbeth to astrology. In 1911 Elsbeth met Albert Kniepf (1853–1924) in Hamburg. Kniepf also taught Alfred Witte (1878–1941). Witte went on to develop the so-called Hamburg School of astrology. German astrology texts were sparse except for Theosophical stuff. Some of Alan Leo’s books were translated into German. Developed an immediate interest in mundane and natal astrology. Early natal work focused on royal nativities. Began publishing mundane astrology pamphlets about WWI in 1914. Became very popular, and went out of print. Republished them in her first book Royal Nativities (1915). Only spoke at an astrological conference once, that we know of, delivering a public lecture 2 July 1923 at 8PM at the second nationwide astrological conference in Germany. What sources did she draw on? Firmicus is mentioned as one. C. Aq. Libra’s Astrology: It’s Ethics and Technics, newly translated into German in 1915, which is why it appears mid-stream in Royal Nativities. Later in her mundane work she draws heavily on Ptolemy. Europe still had strict laws against fortune telling in the early 20th century. Elsbeth was brought in for police questioning in 1915. Elsbeth had to talk her way out of issues with this, as did other astrologers. May or may not have agreed to not see clients. Success and publications during her middle years. Prediction of the death of Czar Nikolaus II (d. 1917) brought her to prominence. Started publishing yearly almanac after war ended in 1917. Predictions for all 12 signs. Eventually established Regulus Verlag to avoid issues with other presses. 1925 novel turned into film, which has been lost. Influence on her son’s career. Often said to have predicted Hitler’s rise early in his career. Hitler fully comes to power when he becomes Chancellor in 1933. Nazi censorship laws became increasingly oppressive not long after. Nazis began shutting down astrological publications by 1938. She continued private astrological studies, but no more publishing. She was killed in 1944 at the age of 64 when an allied bomb hit her home. Her son suggested that some significant research was lost due to the bomb. She researched fixed stars and medical astrology, but didn’t publish much. Some of this research ended up in her son’s work later on. Only one book of hers was translated into English until recently. Largely forgotten even in the German astrological community. Most of Elsbeth’s publications were time-sensitive. Was a student of Gary Lorentzen in high school (he appeared in episode 75). Developed interest in astrology and German studies. Noticed that no one spent much time talking about the women of this period. Began working on Elsbeth in 2012 after some work on Olga von Ungern-Sternberg in 2010. Completed MA and PhD studies focusing on this period. Plan to translate many of Elsbeth’s astrological works as well as other major primary sources from this period. Launched a Patreon campaign in 2016. Crowdfunding the translation of Elsbeth’s works. Some texts will be published through the recently established Revelore Press, others will appear with Sophia Centre Press. First volume her 1922 book, Can Assassinations Be Prevented (2017). The next volume is Elsbeth’s 1915 Royal Nativities, with a planned launch in the UK on the 100th anniversary of Czar Nikolaus II’s death. Postscript about the rise of female astrologers in the 20th century. Elsebeth was one of the first of many. Evangeline Adams, Linda Goodman, Liz Greene, Demetra George, etc. Today the astrological community is largely composed of women. Women also have many of the top leadership roles within the community. Pioneers like Elsbeth set the standard that others would later follow, by striking out on her own in order to pursue her passion for astrology. What an interesting and important interview with Dr. Zahrt! The process of translating Elsbeth’s writings has inadvertently reopened the debate for many of us between the relative merits of academic versus popular astrology. This theme is something we’ll be engaging more with as astrology re-enters academia while the world wide web increasingly serves up cookbook interpretations (such as South Node quincunx Cupido). Appreciate the plea for increased tolerance and understanding between those astrologers work with clients daily and those who study in universities. Both are important and serve a purpose. And, not to turn the spotlight away from Elsbeth, she does indeed have a wonderfully intimate voice to which readers will feel strangely drawn. Great episode, thank you! Does anyone know anything about the reported disappearance of Elsbeth Eberton from Breslau in October 1939? Many thanks.